Shutters vs. Blinds - Which one is best for your windows? Homeowners from coast to coast typically ask us this same question: Should we purchase shutters or blinds for our home? Both are excellent choices, but let’s discuss the key advantages of each. Did you know that shutters are the ONLY window covering that can actually add resale value to your home? Well, it’s a proven real estate fact! Whatever you spend on your shutters, you can add back to the selling price of your home. This makes your shutter purchase more of an investment than just an aesthetic addition. Shutters are like premium furniture for your windows. In addition, they offer superior insulation, reducing heat/cold transfer from your windows to your room. They are also great for sound absorption, reducing noise pollution. 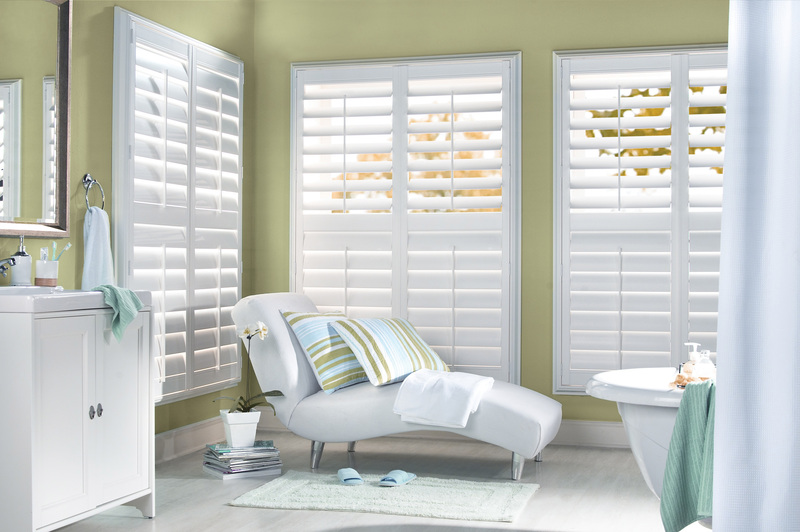 Our shutters are available in fine quality wood, vinyl or composite (a blend of the two). We offer custom paint finishes, specialty shapes (such as custom arched panels, angled windows, and odd shapes), different size louvers (2 1/2″, 3 1/2″ and 4 1/2″) and even hidden tilt bars for a clean, contemporary look. Some people ask us what the difference is between plain shutters and plantation shutters. They are actually the same product reference! “Plantation shutters” refer to a generic description of the style, rather than the brand. The name was derived from the old mansions on the cotton or sugar plantations in the South, where these were commonly found. The term plantation shutter has endured throughout the decades and many companies still use this description for this timeless classic. Wood blinds also add market value to your home with their own aesthetic signature! They are priced significantly less than their shutter rival, so if your budget stands in the way, these offer a pleasing alternative. We even carry “shutter blinds” that have the look and size of a shutter louver for less! Most of our clients who recognize the added value of shutters are willing to splurge a little on luxury! Shutters never go out of style, add traditional elegance and classic beauty to your home, and provide impressive curb appeal. By the way, there are 3 upgrades that add that all-important RESALE value to your home…Do you know what they are? If not, here are the answers! Go ahead…treat yourself and put your windows on the BEST DRESSED list!! Your home (and your neighbors) will thank you! Set up your complimentary, shop-at-home appointment today with one of our window covering experts nearest you, and we’ll show you the best quality products at the most competitive prices in the industry!